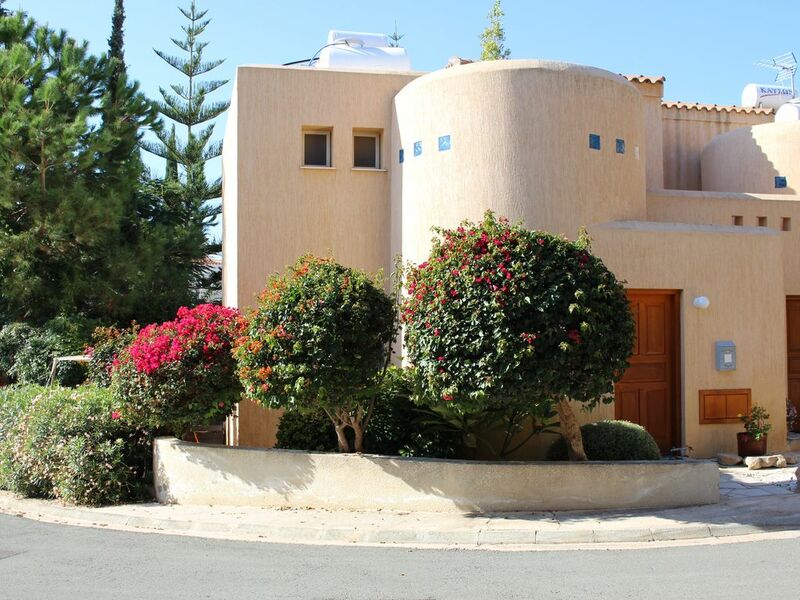 You will love the fresh, chic and bright semi-detached villa that was built at the end of a cul-de-sac. Imagine an exciting house designed in modern architecture with the garden in the center. They are surrounded by trees and flowering shrubs. The 2 beautiful community pools of the small complex are just a few meters from the house. Kastalia Springs is located at the bottom of Peyia and is not far from the famous Coral Bay with its beautiful sandy beach. Along the coast there are numerous bars and restaurants and of course shopping. The sea can be reached by car in 5 minutes, on foot it is just 20 minutes. The airport takes about 40 minutes. On the ground floor is a spacious living-dining area with floor-to-ceiling windows and direct views of the terrace and the garden beyond. In the living room you will find a large TV with which you can receive German programs and a special box English television. For the kids there is an XBox360 with numerous games available. Music can be played back through the Sonos Multiroom speaker system. In addition to the dining area is the large open kitchen, fully equipped for cooking. In the front area is a completely redesigned guest toilet with a floor-level shower. Outside there is a barbecue area with large gas grill, next door is a spacious dining area for up to 6 people under a shady pergola. Here you can enjoy the delicious food from the grill by candlelight. At the end of the day, a cozy lounge corner on the terrace invites you to chill out.